Sprawling gardens with palm trees, hammocks, etc. Stella Beach Villa is a four-bedroom holiday property that has recently been built alongside its sister villa, Stella Beach House. 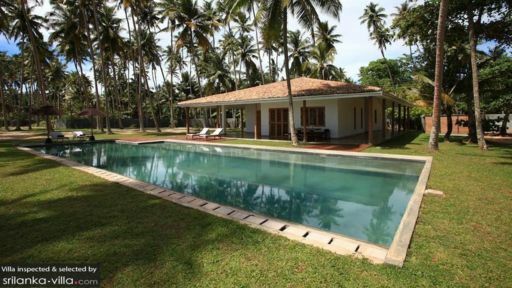 The villa is located near Mirissa beach on the southern coast of beautiful Sri Lanka with direct access to the sandy shores and crashing waves of the ocean. Perfect for families and even groups of friends, the sprawling property has expansive, manicured lawns with tropical plants and tall trees dotting the grounds. 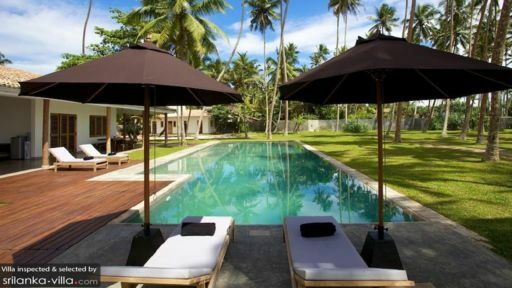 The private swimming pool and modern amenities make this villa the best choice for a tropical vacation with loved ones. The villa is home to four, well-furnished, air-conditioned, and breezy bedrooms that have been designed to offer the utmost of comforts and a homely vibe so you can settle in without any trouble. The rustic and traditional interiors are enough to make you proud of your choice of holiday homes especially with natural stone flooring, four-poster double beds, bunk beds for the kids, and en-suite bathrooms. There is ample storage space for all your belongings, and in case you’re travelling as a bigger party you can always rent out the neighbouring beach house for four additional bedrooms. The 20-metre infinity swimming pool serves as an excellent vantage point for guests to enjoy views of the ocean especially during the magic hour. Once the landscape is doused in cotton candy hues, you’re in for an extraordinary moment. There are hammocks you can lounge on and even take naps or soak up some on the sun chairs found right beside the pool. A gazebo on the garden is the perfect spot for a fresh grill on the barbecue for some delicious food, cocktails, and a plenty good time. The veranda is where you can enjoy a restful time while watching the beautiful scenery and sunset in action. 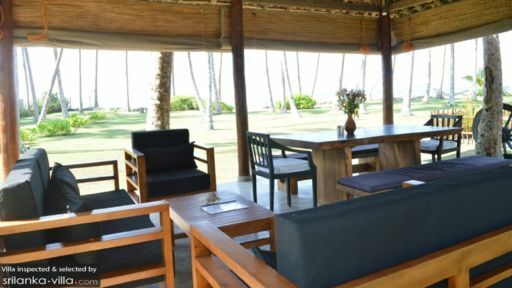 There are comfortable chairs to lounge on and you can kick back with a cocktail and relish the serenity and meditative ambiance. Right from the wooden pool deck, you can head to the veranda, which is the ideal setting for a barbecue as it gives you more room for a garden barbecue party. The dining area is located right under a gazebo amid the fresh air and scenic views for a most romantic and intimate dining experience with your loved ones. Kids and adults alike will love Stella Beach Villa for its accessibility to the beach, amazing views, and child-friendly amenities. The staff can prepare a decadent meal for guests upon request with generous local flavour. The villa is equipped with a flat-screen TV and DVD player ensemble with satellite cable so you can even enjoy watching your favourite TV shows for a lazy day-in. Put on some music on the iPod dock and dance your way around your home away from home. From housekeeping, security, to management and maintenance, everything is well looked after by the staff at Stella Beach Villa. Since they’re all locals, they can even help offer advice of what to do nearby and how to travel. They will be happy to make arrangements on your behalf, if need be. There are so many activities and things you can do in this region and in Sri Lanka as a whole. Since the villa is found near Mirissa beach, you can head to one of the beach shacks and easygoing restaurants for a drink and some light bites. The quiet beach is perfect for a serene afternoon whiling away watching the ocean. Other activities you can do include trekking, surfing, and visiting the turtle hatcheries in Sri Lanka.